The benefits of massage are essentially the same for dogs as humans. Dogs are just like people; during their lifetimes, they will experience bumps and bruises, injuries, or serious trauma. Sometimes, however, after such injuries are treated and healed by a veterinarian, your dog may continue to experience residual negative effects. These effects can be incorrect posture and movement, a decrease in muscle flexibility, or an imbalance in the blood circulation. Eventually, these residual negative effects can accumulate to cause a noticeable decline in your dog’s overall well-being energy, and zest for life. Even if your dog has never suffered an obvious injury, it is getting older, and chances are that it has jumped off the sofa the wrong way or met an unsociable cat face to face. 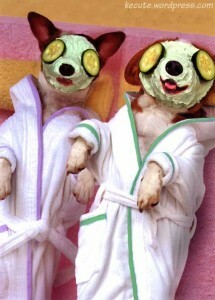 For the ageing dog, massage can get that old sparkle back and make them feel special. On the other hand, massage will benefit even the healthiest, most robust dog, enhancing their talents and improving their well-being and longevity. It is a great way to give affection and attention, particularly if your dog spends long periods alone when you are out. In the following ways, massage is a great way of maintaining and improving your dogs health. Canine massage is taught and should be used as a powerful complimentary tool for behavioural purposes and overall well-being only. Like other techniques, some conditions may exist in your dog where you should not use massage. Please consult your veterinarian if considering canine massage to ensure that your dog has no physical problems which might be aggravated by such activity. Arthritis, fractures, cancer and certain skin conditions are examples of situations when massage may not be appropriate. Canine massage is never a substitute for licensed veterinary care.